Posted on May 21, 2009, 10:05, by glendale2x, under Fail, General, Stuff. UPS Ground packages make it from Las Vegas, NV to Reno, NV by way of Utah. 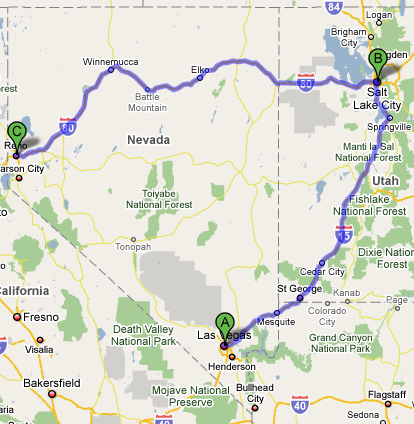 I wonder if anyone ever drives to Vegas using crazy out of the way routes like this because they stick to interstates. Central Nevada’s roads are actually in damn good condition; typically better than the interstates.